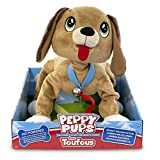 Adorable plush puppy can walk, barking, nod, wags as a real puppy. 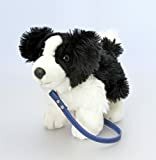 This interactive and friendly dog, responds to your voice and touch. 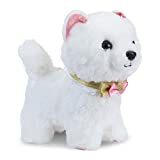 Six features: lifelike eyes and nose, movable tail, soft plush, wired control handle, detachable tie, Removable plush part, easy clean. 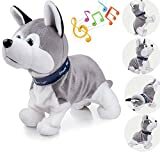 Voice-activated switch: clapping, whistle and other voices, the dog will also bark and walk. Lovely decoration: lovely bow til, sweet bowknot, dog bones with BB whistles. 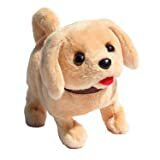 Safe material: plush dog made by imitation wool fabric, soft and comfortable, skin-friendly; Suitable sound decibels, minimize noise. Your little animal walks at the end of the leash. 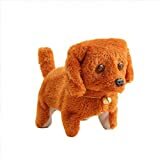 The soft toy measures approximately 25 cm. Requires 4 x AA batteries (batteries are not included). 【Note】 the product uses 4 AA batteries which are not included in the package; it's not allowed to be washed in water for electric unit is installed inside; not suitable for children below age 3; please remove the battery when the toy is not in use; if the sound of the toy is getting weaker or unable to move, please replace the battery in time to ensure the effect of use. Let children bring a pet into the house with all the love and none of the hassle. 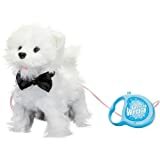 Press the buttons on his leash and this fluffy puppy hobbles to life, inching its way forward and yapping like a dog that's convinced there is someone at the door. It's alarmingly faithful and obedient, even obeying our instruction to walk off the desk. Don't worry, we hugged him better. 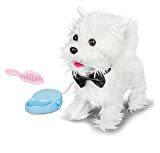 This west highland white terrier may not quite pull off the bow tie look with the suave and sophistication of James Bond, but he certainly looks more adorable than most things wrapped in neckties. 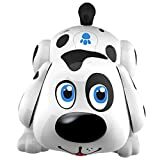 Cute Puppy Toy Dog Pug Walking/Barking Great for Kids!! !